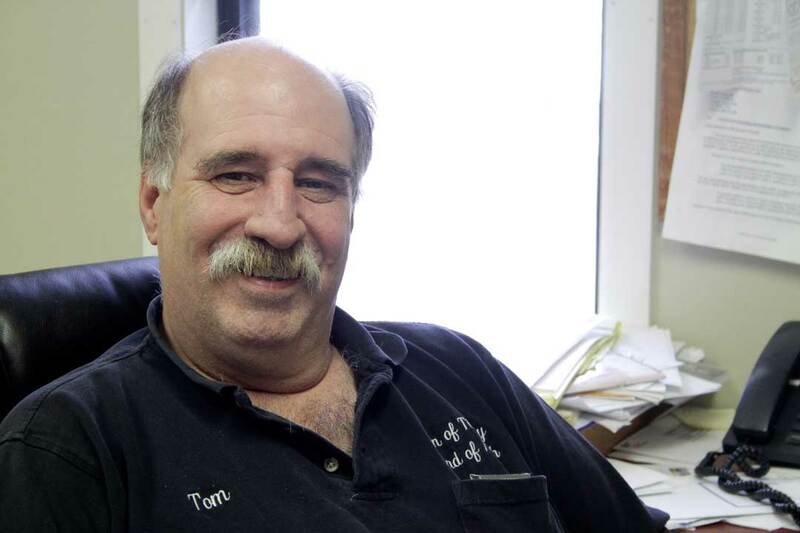 Tisbury voters will have a clear choice next Tuesday as Tom Pachico and Jon Snyder square off for an open seat on the town board of selectmen. In one corner is an outspoken and defiantly proud lifelong Islander with decades of service to the town; in the other, a professed budget hawk and town finance committee veteran with a background in high finance. The two disagree on almost every issue. The polls will be open from noon to 8 p.m. on Tuesday at the American Legion Hall. The two men, who are vying for a seat vacated by board chairman Geoghan Coogan, bring different styles to the race and different perspectives on the town’s direction. Mr. Pachico has served eight years in the parks deparment, 19 as the town health agent and nine years previously as a selectman. “I know the way things are done on the Island and I know the Island like the back of my hand,” he said in an interview with the Gazette. Before he was on the town finance committee for six years, and the all-Island finance committee for four, Mr. Snyder had a long career in Boston, managing investment portfolios for, as he says, “high net-worth families and individuals”. “I bring a good sharp budget eye to town,” he said in an interview. Mr. Pachico doesn’t hesitate when asked where the town should invest in the coming years. Mr. Snyder takes the opposite tack on the town’s upcoming capital obligations. Mr. Pachico has been an outspoken opponent of the Community Preservation Act, which was ushered in under his previous reign as selectman. At its inception, the state matched 100 per cent of the funds raised by a 3 per cent surcharge on property taxes that goes to fund historic preservation, affordable housing and open space. Now the state matches only 35 per cent of the town’s contribution. That is too low for Mr. Pachico, who is also critical about using CPA money in the first place to fund some projects, such as restoring church windows or fixing roofs at affordable housing projects. Predictably, Mr. Snyder takes the opposite view. Mr. Snyder says that town counsel has been an effective watchdog of what he thinks are inappropriate uses of CPA funding, like an article in recent years that was withdrawn after legal scrutiny, which would have funded new sailboats at SailMV. But Mr. Pachico says that Mr. Snyder should have taken a closer look at CPA articles in his role on the finance committee. Mr. Snyder voted in favor of the $3 million so-called connector road that would have connected Edgartown-Vineyard Haven Road to State Road in his capacity as finance committee vice-chairman, but spoke against the article at town meeting when, he said, it became clear that the town would not be able to attract any state funding for the project. There are still more differences in the two men’s financial philosophies. They differ on the town’s recent decision to lower the tax rate for commercial property owners, shifting some of that burden back onto residents. Mr. Snyder is more sanguine about the adjustment. And the two differ on the town’s recent history. Mr. Snyder is complimentary of town management which in his opinion has effectively weathered a recession that has crippled other municipalities in the commonwealth, while Mr. Pachico is critical of what he describes as an inability on the part of selectmen to say no to new projects. Even their spare time is spent differently. “I like to hunt and fish and spend time with my kids,” said Mr. Pachico. The selectmen’s race is the only contested race on the ballot. Chico, Are you the one who use to live in Evansville, IN?